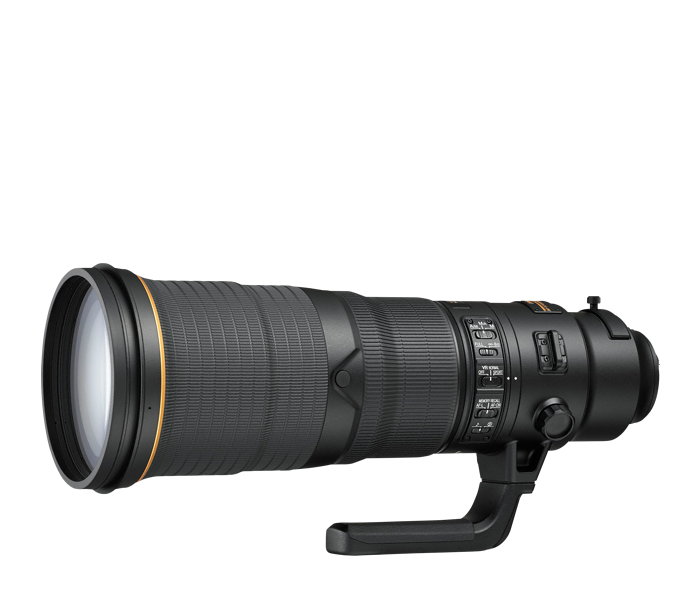 Nikon's legendary 500mm super telephoto lens is now nearly 0.9kg lighter than the previous model and ready for the most demanding conditions. With brilliant optical performance, improved AF tracking, a high-speed electromagnetic diaphragm that keeps pace with Nikon's fastest DSLRs plus VR image stabilization, the AF-S NIKKOR 500mm f/4E FL ED VR is a game-changer for outdoor, sports, action and nature photographers or anyone looking to get the most out of their current DSLR. The lens comes with a new lightweight hard-shell case. This is a lens built for tough assignments. A new magnesium alloy lens barrel and fluorite elements reduce the overall weight by nearly 0.9kg versus its predecessor**. The protective front meniscus is coated with Nikon's nonstick fluorine coat, which makes it easier to wipe off water, dirt and smudges. Ball bearings in the tripod collar ring ensure smooth transitions between horizontal and vertical shooting.